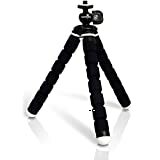 iGadgitz small mini tripod with 1/4 inch screw thread suitable for Digital Compact Cameras. 3 Flexible legs allow you to secure your camera almost anywhere providing a range of shooting angles. Only 17.5cm in height. Can support maximum weight of 275g. Perfect for both amateur and professional photographers. The iGadgitz small flexible mini tripod lets you position your camera almost anywhere to help you capture the perfect shot. Completely flexible and versatile, it simply & securely fastens to your camera in seconds. Featuring flexible leg joints that bend and rotate in all directions so you can wrap it securely to or on just about anything. Wrap it around poles, posts, railings, branches, rocks and much more. Rubber feet grips provide enhanced stability on uneven surfaces. The tripod fits easily in your camera bag without adding noticeable weight – it weighs just 68g with height of 17.5cm only!